For improved reading experience on the go! Comfortable reading by concentrating on the text content. Better readability on all devices including smartphones and small screens. Read immediately at any speed connection. Everything with just a click, may it be a website or an email. Spread your news. Take advantage of the dynamic and viral feature of social media. Download editions so you can view them anywhere at anytime. View all advertisements in one place or search for that specific ad in mind. Access to previous articles in seconds so you can view editions that you have missed. Listen to an article while you're on the go. 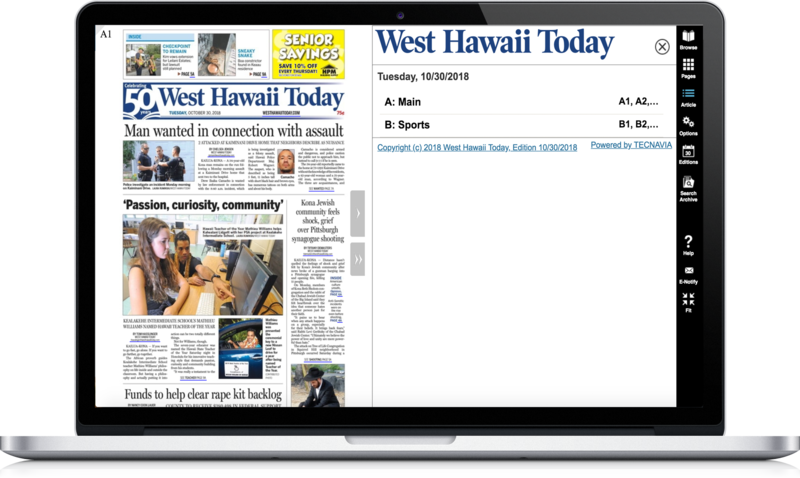 How do I access the print replica from the West Hawaii Today website? Head over to westhawaiitoday.com and click the e-edition link at the top, left-hand corner of the homepage. 75-5580 Kuakini Highway, Kailua-Kona, HI 96740 | (808) 329-9311 | © West Hawaii Today 2019. All rights reserved.